It is important especially to note the difference in position of the right hand. If supporting the head of the Buddha, the image denotes that the Buddha is resting (see story below). If the right arm is lying done next to the body, the image denotes that the Buddha has entered into Nirvana (has passed away). Note on the images, that the left foot is positioned right on top of the right foot, and that the robe of the Buddha is such as it would be if he was standing up. Reclining Buddha at Wat Imprumoon, Ang Thong province. 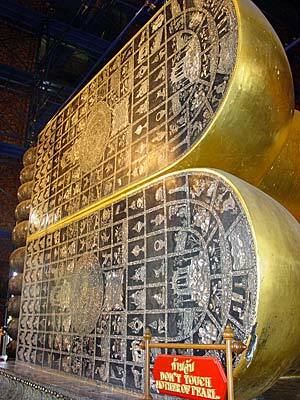 Why are reclining Buddha images so large? Well it likely relates to a 'story' of the life of the Buddha. The giant Asurindarahu wanted to see the Buddha, but was reluctant to bow before him. 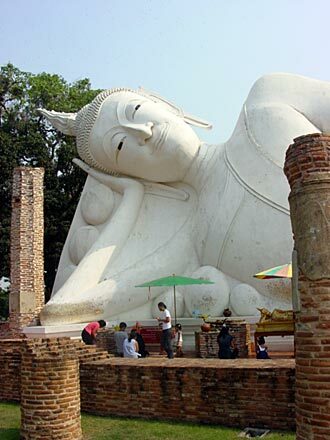 The Buddha, while lying down, presented himself as much larger than the giant. He then showed him the realm of heaven with heavenly figures all larger than the giant. After all this, Asurindarahu, the giant, was humbled, and made his obeisance to the Buddha before leaving. Wat Pho : As often is the case, the soles of both feet of the Buddha display the 108 auspicious characteristics of the Buddha.